uBuyFurniture's leather office chair collection offers a solution for every business or home office. We have leather executive office chairs, big and tall leather chairs, and leather task chairs available in many different styles and colors. With comfortable seating, adjustable features, and casters on many of the chairs, you are sure to find an option that fits your needs and helps you create a productive workspace. 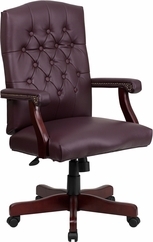 All Leather Office Chairs ship FREE to the continental U.S., usually in 2-3 business days!